Leviton's 1-Gang Flush Mount 2.15 Inch Dia. Device Receptacle wall plate is made of standard stainless steel Type 430 ( 0.32" thick) and features rounded edges to prevent injury and wall damage, resistance to corrosive effects of sunlight and moisture, as well as an easy to clean smooth finish. 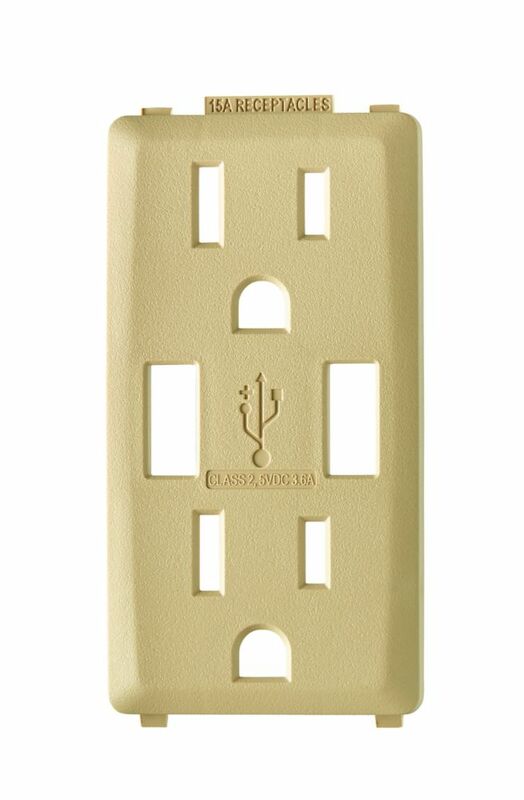 Leviton's 5-Gang Thermoset Decora GFCI Device Decora wall plate is photo electrically colour-matched to other Leviton Decora devices and is designed for high dielectric strength and arc resistance, as well as resistance to fading, discoloration, grease, oils, organic solvents, and moisture scratches. QuickPort Decora Wall plate Inserts offer designer style to match Leviton Decora electrical switches and outlets, with the capacity and flexibility to support high-tech communications for boardrooms or workstations. Available in ivory, black, gray, white, and almond. Face Plate for 3.6A USB Charger/15A Receptacle (Wallplate not Included) in Dapper Tan Renu in a snap! Renu is the smart line of decorative electrical products from Leviton. Install Renu and get a fresh stylish look, plus the ability to change the color of any Renu device when you update a room. The line includes switches, outlets, GFCIs, dimmers, and sleek, screwless wallplates available in 20 designer colors. The Renu face plate RKAA1 makes it a snap to change the color of Renu 15A USB Charger/Tamper-Resistant Receptacle/Outlet, without rewiring or needing an electrician. Just order a face plate in the color of your choice and follow the simple directions to replace the existing face with a new hue. Snap on a wallplate (sold separately), and you're done.